Five-star amenities like concierge desk, room service, spa treatments, etc. 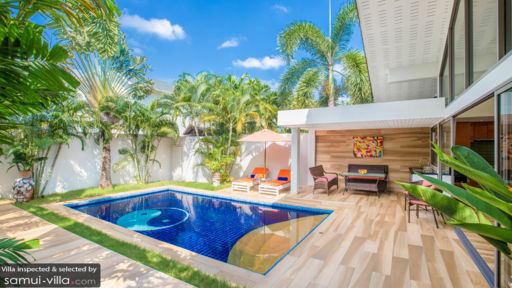 A two-bedroom charming holiday home on Ban Tai beach, Villa Aperol is a quaint villa perfect for couples and small families. Part of the privately-managed Ban Tai Estate, guests of the villa are entitled to many of the services extended by the resort including concierge, room service, and others. The villa is spread over two storeys with the façade designed with floor-to-ceiling glass walls for a beautiful view during the day and a whimsical soft ambiance once the sun sets. You have your private swimming pool out back with a pool deck, a lounge bale, and other facilities for a better experience. Villa Aperol is home to two gorgeous bedrooms that feature a crisp, elegant, and modern décor with double beds standing in the middle, soft warm lighting from the false ceiling, neutral shades for a soothing ambiance, and even a work desk in one bedroom if you wish to finish some work. One bedroom is downstairs while the other is upstairs with a corridor that overlooks the scenery. Both rooms are air-conditioned for a cool and calming ambiance when you sleep. Each bedroom comes with an en-suite bathroom with walk-in showers and other amenities. A beautiful mosaic-tiled floor swimming pool with a striking yin-yang symbol in the middle stands under clear, blue skies dappled with candy-coloured clouds. While you’re sunbathing and soaking up some of that tropical sunshine, enjoy the serene and peaceful ambiance without the honking of cars and construction noises; definitely wouldn’t miss these. There are comfortable sun loungers on the pool deck for you to relax on as well as a poolside modern gazebo with rattan sofas and armchair for a nice, refreshing spot for a cup of tea in the morning and evening. There is barbecue facility available to guests to enjoy freshly-grilled food. From the poolside lounge, you can head indoors to the living area that is tucked away behind sliding glass doors giving you a clear view of the pool and lush flora. There is an L-shaped sofa in the corner upholstered with a subtle shade of powder blue and the soaring ceiling adds more space and breathing room to the area. The brightly-lit living room also has a TV so you can watch some movies and your favourite TV shows. Guests can enjoy a hearty meal at the breakfast bar that doubles as a four-seater dining table with high, rattan chairs. 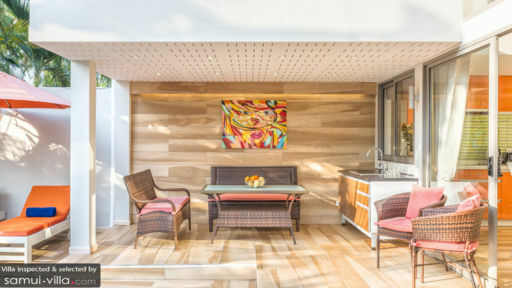 The orange-coloured backsplash of the fully-equipped kitchen brings even more colour to the area coupled with the verdure of the outdoors. There are modern appliances and amenities so you can even cook a light snack if you desire. Villa Aperol is part of Ban Tai Estate which is a luxury resort that offers world-class amenities and staff services to its guests. From a concierge desk where you can ask for recommendations and they will book your transport and any excursions for you to spa treatments, the staff is happy to make arrangements on your behalf. 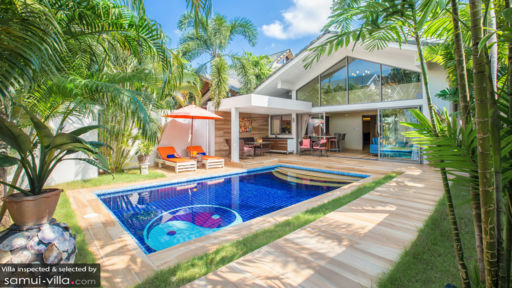 Found on Ban Tai beach, the villa is surrounded by gorgeous views of the sea and you can easily head to the many attractions Samui has to offer. There are plenty more white sand beaches, beach clubs, and nature walks to be enjoyed. Nikki beach club is a popular spot for some good music and excellent company. There are seafood restaurants and many serving local Thai cuisine for a rush of flavours.